Instead of looking for change to make copies, patrons of the Central Libraries can now take advantage of a change for the better. The Moody and Jones Libraries of Baylor University have installed three Knowledge Imaging Center (KIC) scanning stations. Gone are the days of paper jams and copious copies while trying to flatten a book to avoid blurry text images or to capture perfectly centered facsimiles. With user-friendly technology, KIC scanners allow students and faculty to capture digital images of study materials to their portable flash drives. 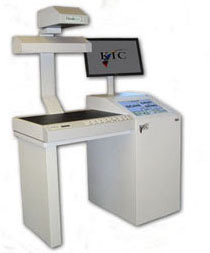 The KIC scanner can handle virtually any size book, magazine, journal, newspaper, photo or other material from postage stamp size up to 17 x 24 inches in black and white or full color. The images and even text from PDF files can then be pasted into reports or research papers. Not only does the KIC scanner make digitization easy, but it is also good for the environment. Since users merely save the images to their flash drives, paper copies are obsolete. This means a reduction in paper and toner usage, which is good for both Baylor University and the environment. So drop by the Central Libraries and check out the KIC scanning station for yourself. The scanners are located on the first floor of Jones Library, Moody Memorial Library on the first floor near the elevator and in the Garden Level Information Commons.